As the weather warms up, we are getting in gear to prepare for the new Odonata season. I wanted to do a short note to highlight a few upcoming events and other thoughts. 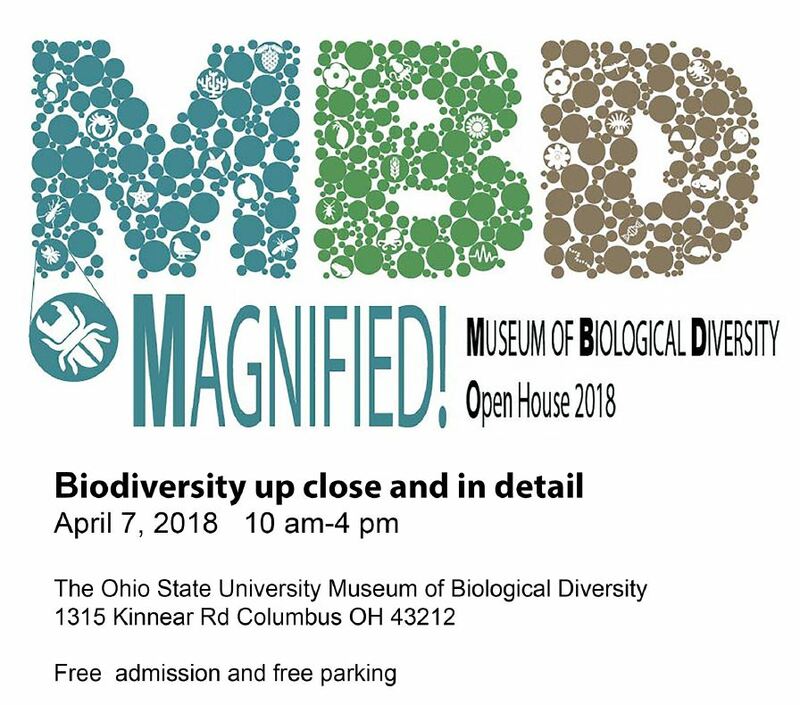 April 7th – Museum Open House! Join us at the Museum of Biological Diversity to learn about all of life, not just Odonata. April 26th – We are also hosting an evening training session for Central Ohio Odonata enthusiasts on April 26th! We would love to see you for this evening workshop! No registration required. June 22-24 – Finally, if you haven’t done so already, don’t forget to sign up for Odo-Con-18! Pre-registration is required so we know how much food to order for the Saturday dinner. Thank you again to all of the survey volunteers who contributed data last year. With your help, in one year we have acquired more data than the half decade of the first survey! We have been going strong with outreach over the past few months. Linda Gilbert spoke bout Northeastern Odes at the Ohio Natural History Conference (ONHC) with 220 attendees. MaLisa Spring and Jim Lemon also presented a poster at ONHC. MaLisa also had the opportunity to speak at the Wildlife Diversity Conference to over 1,000 wildlife enthusiasts! Various collection permits have been acquired. 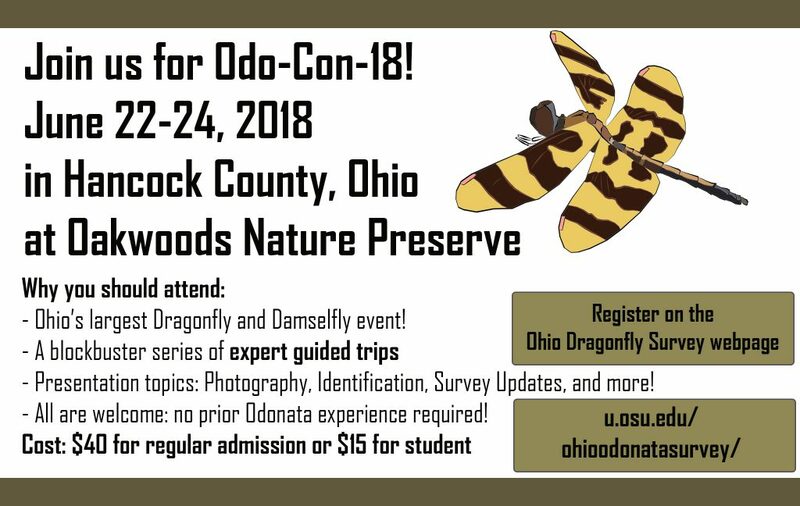 If you plan on collecting on behalf of the Ohio Dragonfly Survey, please get in touch with MaLisa at spring . 99 at osu . edu. Our work at the Ohio EPA verifying larvae is not over. They have decades of larvae that we have not had a chance to look through, so we have several winters of potential identification left. So far, we have several new county records thanks to their regulatory work and many more to uncover as we sort through specimens they have not identified below genus. We really appreciate their cooperation and facilitation of looking through their expansive inventory. For a glimpse of what we are finding, check out the hashtag #OhioDragonfly on Twitter. Many more mini-blitzes, presentations, and other events are planned. If you would like to plan your own event, let us know and we can get materials to you. The website is still being updated! County lists and species in surrounding counties are being added gradually. Right now, we are 3/5 of the way through getting the county lists up. If you want a specific county that doesn’t have its own webpage (possibly SE and SW counties depending on when you are reading this), you can access them in the main excel file for the region. Each excel file is listed on the respective county region page beneath the coordinator description. That is all for now. If you have any questions, do not hesitate to reach out!